Ben Robinson|GoBuccs.com Covington girls basketball coach Jim Meyer always had a great relationship with his players, like Lauren Christian (44). COVINGTON —- After seeing his coaching career come full circle, Jim Meyer knew it was time to end that journey after his three years as Covington girls basketball coach. And he couldn’t have asked for a more enjoyable ride. After going 55-32 in five seasons with Covington, then coaching Troy for five years, beginning in 1993, he had a record of 87-24. After almost 20 years hiatus from coaching, he returned three years ago at Covington, when the program found itself without a coach shortly before the season was to begin. He coached the team to three straight 20-win seasons, winning two sectional titles and district title and finishing with a career record of 202-72. This year’s team tied the regular season win record with 18 — and the only reason it didn’t break it was Greenville not rescheduling a postponed game. His only losing season came in his first year at Covington, and in his final season in 1988-89, the Buccaneers won a school-record 22 games and won the girls basketball program’s first district title. Lynnette Roeth, who went on to break the Covington school scoring record, was a freshman on the 1988-89 team. While at Troy, he coached Rachel Brugger, who is in the top five in scoring for the Trojans, and guided the Trojans to a 20-2 record during the 1995-96 season. Two years later, he took a team that much wasn’t expected from all the way to the D-I district finals. When he returned to Covington, current senior Samantha Whiteman was a sophomore. Whiteman broke Roeth’s scoring record and finished with 1,893 points and was recently named the Ohio Division IV Player of the Year, as well as being the Southwest District Player of the Year. And he doesn’t regret a moment of it. “I was always blessed to be around really good kids who worked hard and were a lot of fun,” Meyer said. And they were fortunate enough to have a coach who always made them the best they could be. 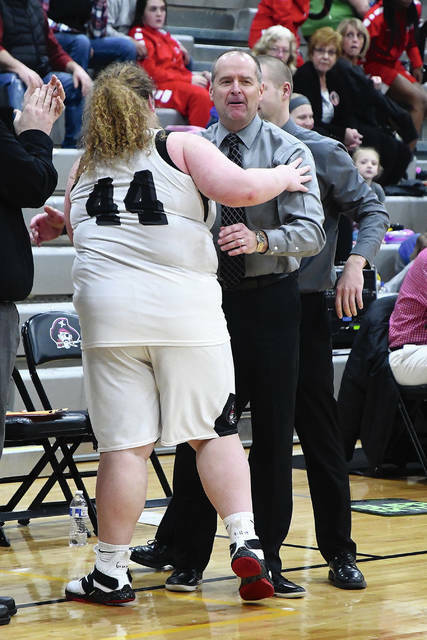 https://www.dailycall.com/wp-content/uploads/sites/30/2019/03/web1_jim-meyer.jpgBen Robinson|GoBuccs.com Covington girls basketball coach Jim Meyer always had a great relationship with his players, like Lauren Christian (44).